Once again it is My Colony update time, and v0.83.0 will be heading out to all platforms within the coming days. This release continues the bug bashing series I have been working on, but also implements a few new features that I hope you find useful. Let's take a look! The first change I want to go over deals with the behavior of the Bulldozer tool, which I outlined in more detail in this thread, but I think it is important enough to mention again because it could potentially cause somebody to nuke a large part of their colony by accident. 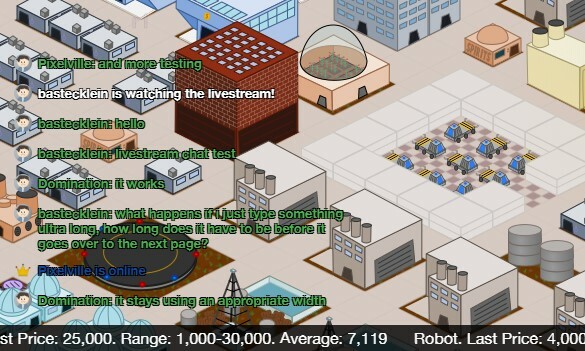 In prior versions, when you would click on a blank space of the map, it would automatically deactivate the bulldozer so that you wouldn't accidentally click on something and delete it. I have removed this safety feature. I have also made it so that you can do a double click/drag gesture to do mass bulldozing. Since this can potentially be dangerous, activating the bulldozer now makes your resource readout bar red in color, so that you are more aware that the tool is active. Here is a quick video of how the tool now works. Back in the first update of the game that included the bulldozer (v0.42.0 in August 2017), you could actually somewhat use it like this, but I nerfed it a bit due to players accidentally bulldozing large parts of their colonies. I am hoping that with the red tinted game, the red border around the screen, and the red resource bar, it will be plainly obvious to all that the bulldozer tool is active. Next up, I have worked with @Sobeirannovaocc to bake the Coloniae ADU service right into the core code of My Colony, allowing it to be used on all versions of the game. Coloniae is a free online service maintained by Sobeirannovaocc that tracks detailed stats and trend histories for online My Colony players. The ADU service is available to all online colonies, and can be turned on by a new setting added to the Statistics screen of your colony. The next few changes involve trade. 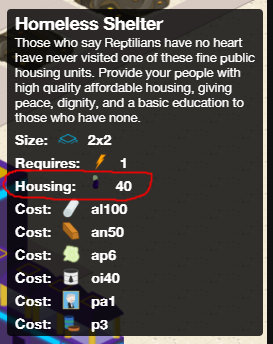 There have been longstanding issues with the GBT, especially for new players/colonies who cannot buy anything because the lot sizes are so big that they either do not show up in their trades, or they are priced totally out of the market. To try to help make the GBT more useful for newer and more established colonies alike, several new changes have been implemented, the first of which is the auto-trader. Auto Trade is in it's infancy and will be expanded and refined in future updates, as I am able to monitor it's usage and the impact it has on the market, but here is how it works right now. Auto Trading is off by default, and can be enabled or disabled on a per resource basis. When the Auto Trader is turned on, every few minutes (it's somewhere between 7 and 10 minutes depending on your device speed) your colonial trade representative will take stock of your auto-trade enabled resources. If your warehouses are full, sell orders will automatically be posted on your behalf. Several trades may be made, representing up to 10% of your supply level. But trades will also be made in lot sizes ranging from small to large, so that all levels of players are able to see and access them in the GBT. The sale prices are based on the current GBT market value of the resource. Before posting a new contract, the Auto Trader will also look at the current Offer contracts, and purchase those if they are a good price and fall within 10% of your total resource level. The auto trader will never just train your supply inventories. Likewise, the Auto Trader will also make trades for you when your supplies are low. If an auto-trader enabled resource falls below 25% storage level, the Auto Trader will check the market for reasonably priced offers, and purchase them. The Auto Trader will not spend more than 2.5% of your total money on a transaction. If no contracts are available within those parameters, a new offer contract will be posted instead. Obviously the usage of the Auto Trader will largely depend on the number of people who enable it, since there ultimately needs to be two parties for each transaction. I am hoping that once more players begin activating the auto trade feature, the GBT will fill up with actual useful contracts instead of just the insane offers that almost nobody can afford or even has storage for. I got the auto trading idea after reading this post by @Conco2 related to the in-game GDP calculation. It occurred to me that there are so many late game colonies that are just fully stocked on all resources, and so their factories really aren't producing anything since all storage is full. Because of this, GDP is stagnant since nothing new is being created. I figured it would be helpful to set up a way to automatically export those goods without even having to think about it, since a real life economy also has to have exports in order to grow. Since the GBT was being underutilized anyway, I figured I would give this idea a shot. 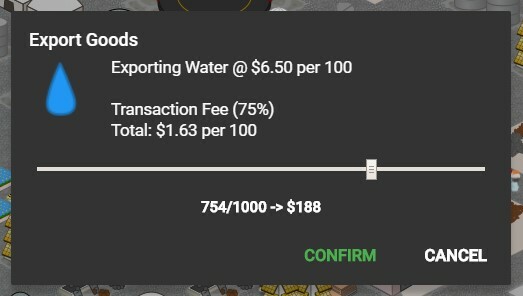 To emphasize the importing and exporting aspect of the economy, the game now keeps track internally of the dollar value of your annual trade income and losses. Graphs for these stats will be making their way to the Economy statistics tab soon. The Auto Trader will need tweaking and will probably have some user customization input options in the future. I just wanted to get the concept out there and see how it actually works, and then go from there. After implementing the Auto Trader, it occurred to me that the GBT would be loaded with Food, Water, Ore, and other low end resource contracts that nobody needs by the time they build the GBT. To help with this, I added a new feature to the regular, non-GBT trade buildings. Now, any building that allows resource importing will also allow you to purchase GBT contracts that fall within the building's trade capacity level. For example, the Galactic Freight can now purchase any contracts from the GBT that have a unit size of 1,000 or less. 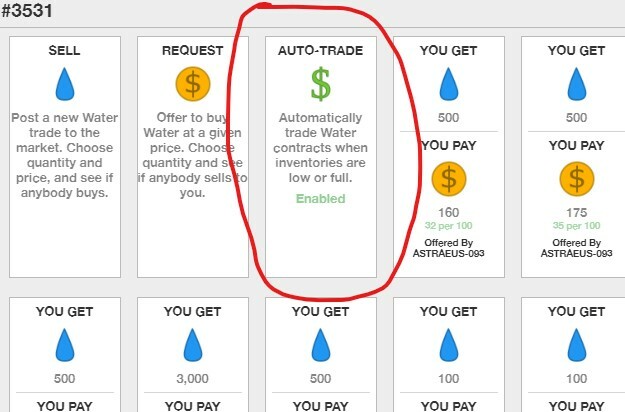 This should actually be really helpful for newer players, as it will allow them to buy needed goods without paying the standard 50% import fee, offering an extreme discount from the normal import prices, while at the same time helping later-game players who are auto-selling contracts using the GBT. The way I see it, it's a win-win for all. I am hopeful that these new trade related features will help address some of the problems with the GBT and online trading in general. Of course, it could also make things worse. You never know! The final change I want to highlight was a requested feature for blank region maps. They will no longer create a river on map types that include a river by default. There were other little changes that you might notice here and there, but this about covers the big things. Let me know what you think and what issues you find. The update should be hitting all platforms with the next few days, so be on the lookout, thanks for playing, and stay tuned for more My Colony! Happy Friday to everyone here, and it's time for another My Colony patch, v0.82.0! This update continues the bug fix series that I have been doing while I work on Colony Wars, but I've also added a couple of features that you will hopefully find helpful. Let's dive in and take a look. Firstly on the bug fix front, every issue that had been tracked to the automatic bug tracker from both My Colony v0.81.0 and Antiquitas v1.22.0 has been resolved, along with a few other issues that I noticed while digging through the code. One of the biggest issues in My Colony deals with corrupt save files. While working on this update, I noticed that ever since I implemented Regions way back in September, the game was no longer saving backup copies properly for single city maps or region overview maps. This means that besides for sub-city files, no backup saves (the *.mcb files) were being done properly. For those who are not aware, when you save a game in My Colony, it creates the compressed (if compression is turned on) *.mcz save (that also syncs to the cloud if you have cloud sync turned on), and also an uncompressed *.mcb file that saves only to the local device. When you go to load your colony, it first tries to load the *.mcz cloud save, then the *.mcz local save, and if those do not work, it tries for the uncompressed *.mcb backup save. What was happening in the code is that first it was saving the uncompressed backup save as a *.mcz file, and then saving over it with the final compressed *.mcz file. So there was no backup. This means if that there was an error in the compression for some reason, there was no uncompressed backup to fall back on. It also means that if there is an old backup *.mcb file saved somewhere on your device from before the error occurred, opening a file could potentially restore that old backup and override everything you had done in the meantime. I also noticed that a majority of the save corruptions seemed to be happening on Windows 10, Android, and Desktop. These also happen to be the three platforms where save compression was turned off by default. I had it turned off because compression can cause memory issues when saving cities that have been expanded multiple times and have millions of citizens. Since I am more moving towards Regions being the default play mode though, I decided to turn the compression on by default on all platforms to see if it helps. You can still turn it off on a per-colony basis if you want to. Next up, I made it so that importing and exporting goods through the Mass Driver/Star Gate (etc) type buildings no longer has to be done in fixed lot sizes. 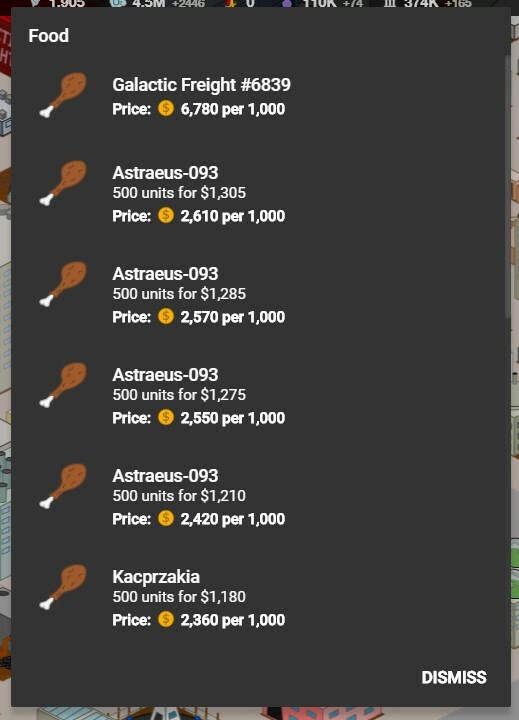 Now when you go to make a trade using these buildings, you will be presented with a slider dialog that lets you make trades up to the max that the structure supports. I still need to make improvements to the dialog, but it should make some of the buildings with the ultra-large capacities a little more useful. Next, I have also made changes to the in-game notifications and especially that chat, which should hopefully make them more useful. First, if you are using the "Desktop" style interface (the one with all of the build options appearing in the right-side sidebar), in-game notifications will now show up in a notification area at the bottom right of the screen, instead of popping up in the bottom middle. When you have notifications there, there will be a new red x icon in the bottom right corner that lets you clear all notification messages at once. The other change is that all chat messages now show up in the notification area. This only works when you are signed in to the chat server, but now once you sign into the chat server for a colony at least once manually, you will automatically be signed in each subsequent time that you open your colony. That way, if you are playing your colony and somebody is trying to talk to you on chat, you will know it without actually having the chat window open. You will also get livestream chat notifications, and notifications when somebody decides to watch your livestream. On mobile (or if you are not using the "Desktop" interface), you will still get new chat notifications, but they will pop up in the same way notifications currently work, in the bottom-middle of the screen. As always, you can turn off all notifications in the engine settings menu. Finally, the Russian language translations by Anton zlo have been expanded in this release, and a full set of French translations has now been provided by @Sobeirannovaocc and @Freedmoon ! This is great news for players using Russian and French, so please be sure to show your appreciation for their hard work and efforts. Just a few final words before I go here. I plan on doing another episode of the My Colony Podcast soon, probably at the beginning of next week. People seem to be enjoying the show, so I will be making it a regular thing again. If you haven't checked it out yet, please do! Next, I plan to have a multiplayer beta for Colony Wars soon(ish). I wanted it to be done by the end of this month, but coding the AI is taking a bit longer than I had planned. I've got it now to where the AI will build their base, but they are still a bit too stupid at it. The beta will be coming before long though, and it is going to include the map editor, as well as multiplayer, supporting LAN/Online/ and AI skirmish. I hope to have the multiplayer matchmaking server running by the end of next week, so that I can get some people online to test the multiplayer out. Anyway, that is all for today's My Colony update. It should be hitting all platforms throughout the weekend here. I plan on starting the next My Colony update (v0.83.0) on March 1 (I am actually half way planning things now), so get those bug reports filed before then. I know a lot of people think I do not read the reports since I do not post replies, but that is not the case. I just do not see the need to post "Ok" or "Thanks" at the end of each bug report. Stay tuned for more, and thanks for playing the game!! Edit: v0.81.0: I'm not going to make a new post for this, but I am now pushing out patch v0.81.0 that fixes an issue where the build options menu for vehicles would not appear. Sorry for the issues! Today I am pushing out the v0.80.0 release of My Colony, and it should be hitting all platforms within the coming days. As I mentioned in the last update, I have been getting a lot of requests to slow down on content updates until some of the bugs and issues in the game are ironed out, and so that is what I plan to do over the next few updates, before I dive into the big Federations expansion which will probably leave the game broken again 😳 Just kidding (hopefully)! Anyway, let's see what is new with this release of My Colony. Firstly, I have nerfed the Research Converter a bit, as it was slightly overpowered. It might still be overpowered, but it's a little better now. It now consumes more money and research, costs more to build, and produces at a little slower rate. Moving on, many people have asked me to change the file names for region subcities, which were previously named with a timestamp, making it hard to tell what they were. So going forward, new regional subcities will be named like this: [region-name]-[subcity-name].mcz, making it a bit easier to tell what they are. This does not impact current cities though. I have made it easier to share a saved file that is tied to an Ape Apps Account. You might recall that in the last update, I added the option to make an offline copy of a colony so you can share it with others. This has now been expanded a bit, to where if somebody gives you a colony file that is NOT a copy but is tied to their account, the game will automatically make it an offline-only non-account copy when another user tries to import the file into their game. Next, the often requested 'Leave Federation' option has been implemented. It is fairly straightforward, you will see the new Leave Federation button on the Federations screen. On all platforms, the Achievements window has been updated. It now shows achievement point values and total progress. Newly unlocked achievements are now also synced to your Ape Apps Account when you are logged in, keeping your achievement progress up to date across platforms. I might add more achievements to the game in the coming updates, so let me know what types of achievements you are interested in! 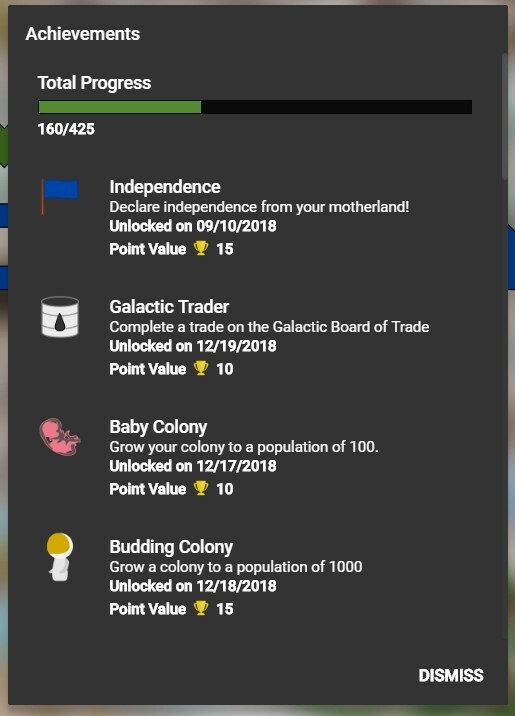 Next up, I have added a new policy to the Policies menu that allows you to block new tourists from coming to the colony, just like you can currently block immigration. The new option requires government level 3 or higher. There were also a ton of bug fixes and improvements in this update, and I will just discuss a few of the larger ones. First, I think I have finally solved the issue where incinerators (and similar buildings) would shut down forever if you ever ran out of trash. You can let me know if you are still having the problem, but I think it's fixed. Next, there was a huge issue involving how virtual colonists were organized and processed that, in large colonies, could potentially cause freezes and hangups of several minutes on regular intervals. The issue has been corrected in that it will not happen anymore on new colonies, but on existing colonies, the engine will slowly sort itself out. Slowly is the key word though, as a colony with over a million population would require more than a day of idle time to get sorted out. The slowness was required to let the colonists sort themselves out without completely killing the economy of the colony. If you want it to go faster, you will have to just kill off all of your colonists and let your population regrow. Most colonies are impacted by the issue, but the real problems are not apparent until populations are in the millions, so most people should be fine just letting the fix sort itself out behind the scenes. Several optimizations have been made in regards to tourism. Tourism had the potential to really kill the performance of a colony, especially on large map sizes. The game was designed to place new tourists into 'simulated' mode so that they find entertainment without using the pathfinder, after you had so many tourists. However, this function was written when tourists only showed up a few at a time, so it was able to keep up. 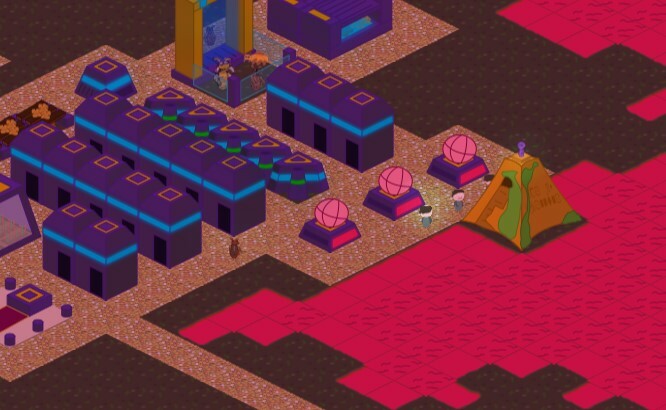 With the introduction of the Space Ports, tourists were able to show up way faster than the game could keep up with, and you would run into a situation where the pathfinder could not keep up and would cause memory consumption to keep growing and growing. The engine is now much more aggressive at simulating tourists than it was before. Also, if a tourist does not find a tourist destination within a 60 tile radius of their arrival spot, they will now just leave instead of making the engine keep searching for a destination in a larger and larger radius. There are further optimizations planned for tourism in the coming updates, but if you have a large map with 10k or more tourists, consider using the new policy to block tourists from coming to the colony, which will let them slowly dwindle down as they run out of money. I do not think these tourism issues have much of an impact on small and medium sized maps, but on maps where people have done the Annex policy several times, it can really kill the game. Next, after literally years, I have posted a new episode of the My Colony Podcast. Feel free to check it out, and let me know if you would like to see me bring the My Colony Podcast back from the dead. If I limit it to shorter 10 minute(ish) episodes, it wont be too much or a burden to do. That's all for today's update. Should be hitting all platforms over the weekend, so keep a lookout. Let me know what issues you find, as I will be going hard after bugs and performance over the next few updates. Thanks for playing, and stay tuned for more! So I've just put the finishing touches on My Colony v0.79.0 and it should be hitting all platforms within the next few days. I had initially planned a great content update for this release, but I have been getting a lot of requests in email and in the app store comments to stop adding content and work on engine improvements instead, so that is what I did for today. There are a few new things in this release, so lets take a look! As with every update, all of the hard syntax bugs reported through the app store error consoles have been addressed. In addition, I think I finally have the duplicate Federation balloting issue resolved. I have also made a handful of improvements to the rendering engine. You will particularly notice that on a Water World map, there are no longer "waves" where the water tiles were not lining up properly when you zoom out. I have also corrected a long standing rendering issue where some of the edge tiles would either a) not show up at all, or b) flicker on and off continually. Other small rendering improvements were made, but are not worth a write-up. Performance should be slightly improved as well. 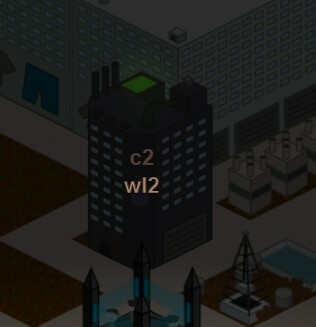 I noticed (and corrected) an issue where colony resource stats were not being synced at all to the server if you were playing a sub-city to a Region game. This was not a major issue if you saved/quit your region game completely back to the title, but for users who didn't, it would result in lost resources the next time they started their region and it pulled their saved resource levels from the server. This is now resolved, and hopefully it helps the issues some people have with their regional resources not saving right. Next up, I added a new feature which should hopefully help with debugging all of those odd issues that are reported by only 1 or 2 people and are almost impossible to reproduce and debug on demand. Since back when I tied online games to your Ape Apps Account, I have been unable to access and debug other players save files when they are having an issue. To get around this, I have added a new 'Offline Copy' option to the bottom of the stats screen. This creates an exact clone of your game, except offline (and with a different file name). You can then export this cloned copy and send it to me if you have an issue you want me to look at. It is also handy if you want to test out some big changes to your online colony before actually committing them to your main save file. If you make a clone of a sub-region file, it becomes its own stand-alone map, it does not duplicate the whole region. 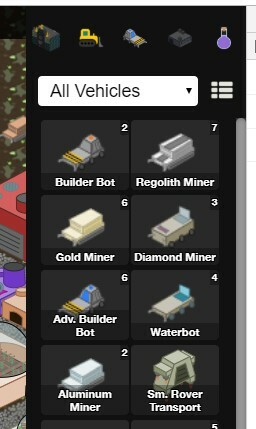 I have had several requests to add vehicle build counts to the construction side bar. Here they are. Also, I did get one new structure added to this build, the Research Converter. This is a late game Human structure for burning off your excess Research and converting it into raw materials. Might still need some balance tweaking, you can let me know what you think. It's basically like a Black Market Bazaar on steroids, and it also consumes Research. Finally, this release includes the first batch of Russian language translations, there are just about 300 translated strings in total, but it covers most of the common ones. Russian is by far the most requested translation for the game, as Russia is the #2 market for My Colony in the Play Store outside of the U.S. More translations will be forthcoming. That wraps it up for this update. Keep your eye on the app marketplaces over the next few days for the release to hit your platform, and stay tuned for a lot more My Colony goodness to come!